Dr. Eggman challenges Sonic and his friends to a Worldwide Grand Prix, and the prize for coming out on top is an ultra-rare Chaos Emerald. Gliding on air boards – which are performance-oriented for each playable character – gamers will experience a heightened sense of sports-style racing tension as Sonic and his pals perform tricks and stunts over treacherous wide-open terrain. Sonic and friends speed through tracks on air boards, using individual special moves to strike down opponents. 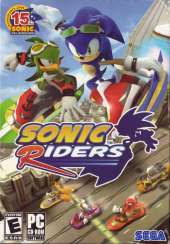 Air is a big element of Sonic Riders. Your board's "fuel" source is air. You can fill up your air at various points on the course, but to race well you'll have to use another means of replenishment: performing tricks with your board. You'll also want to make use of turbulence from racers who are in front of you.